Do aquaponics yourself and do it without spending much. Not a beginners system but something a family could plan for. This aquaponic system is designed so that even someone in a third world country can feed a family of 4 or more, with vegetables and fish. We did the system from used plastic barrels and about 20 feet of PVC, a saw, a drill and some glue. It can be powered on a standard electric plug, using an old boat sump pump, or, we found some used solar panels and hooked them up to a used car battery, thus the entire system is free from the grid. Fish dirty water waste is pumped to barrels filled with gravel, and the plants and algae convert the ammonia, nitrites into nitrates, and feed on them. The process clears the water, replaces the CO2 with Oxygen, and pumps it back to the fish. Here is a program that Eden Gardens can use in food production campuses around the world, or you in your back yard. Power it with wind turbines, or solar panels and build a greenhouse and you have a commercial agricultural operation, that is energy free, and water can be pumped from irrigation powered with sun and wind. One of our mentors; Sylvia Bernstein of The Aquaponic Source in Longmont, CO. gets some TV time! The first working aquaponics system found by GGG Admin in Galion is MKB Farms. Read about them on the Ohio Aquaponics TAB. I know there are more; if you are one, or know of one please let me know. Happy Greens in Ashtabula was also added. Check out our companion blog; Galion Community Gardens to see the support and activities in progress for aquaponics being included in the proposed community garden. This blog will continue to add new thoughts and ideas about aquaponics. I just needed 10 days to get the other blog up and running. Aquaponic Farm Open House this Saturday! "Fresh Harvest Farm invites you to see what aquaponics is all about at our Open Farm Tour, this Saturday, October 19 from 2-4 p.m. Stop out to see how we are growing our fresh, chem free greens and learn about aquaponics. [sig] Jeni Blackburn"
Goggle Maps will give you directions. It is an hours drive but seeing a real large-scale working aquaponics system and being able to ask questions will be well worth it. For those interested in the community garden project as soil-based gardeners and have a how-to need, Gary Pilarchik has dedicated nearly 250 videos to tomato and vegetable gardening, seed starting, mostly organic fertilizers, home remedy pest and disease control on his YouTube channel - Gary Pilarchik. Gary's Blog = The Rusted Garden where he introduces another video series for beginning gardeners. Gary also has a Yahoo Group of 2500 members! Dr. Nate Storey ,Ph.D, Co-founder of Bright Agrotech is an outstanding example of a product salesman providing comprehensive and comprehensible aquaponics education, not just a teaser presentation to get his audience (newbies) to purchase his product(s). I commend him for that. Purchasing his system wouldn’t be a bad thing! I find his videos and website most helpful and subscribe to both and suggest you do too. He recently started a new series covering nutrients in aquaponic systems. He publishes one or two videos a week. The first three are listed below. Plant Nutrients for Aquaponics – Bright Agrotech – 6:10 mins. Plant Nutrients: What happens to them in your System? – Bright Agrotech – 6:58 mins. Aquaponic Plant Nutrients: Nitrogen – Bright Agrotech – 7:20 mins. Good pictures of what could be done here in Galion on their website. They even show a snow-bound hoop house! Submitted as a 'Food for Thought' entry. Community Garden -What others are doing! This is a current HOT topic in Galion. In that this blog is about aquaponic gardening, of course we are going to promote it. However, we have listed below a few examples of other community efforts in conventional 10' x 20' plots of in-ground gardening. For those thinking in those terms I would like to suggest that they consider planning for raised beds, table-top boxes, other container gardening, and directed self-watering methods. We do want to include youth and seniors and the bend-over impaired (like me = getting down is easy, getting back up is a challenge) don't we? Larry Hall's videos on self-watering and other clever economical set-ups are available on YouTube and under our Horizontal Rails Tab. Be sure to check out his Kiddie Pool set-up as well for cluster watering. The Crawford County Ohio State University Extension and Master Gardeners are offering a community garden to anyone who is interested. Plots are 10 foot by 20 foot and on the Unger Farm next to Unger Park. Cost is $20 and the plots come fertilized and ready for planting. For details, call the OSU Extension office at 419-562-8731. Community garden in Bremen grows in unused school lot. Gardeners get the plots for free as part of a University of Virginia program and in return, they donate part of what they raise to a food bank or service organization. I attended one of the most positive civic meetings I have ever experienced. The committee, Shirley Clark and Missy Harris joined by the Mayor, Tom O’Leary were open to and supportive of the suggestions by the citizens attending. The funds available to the committee were announced. The mayor stressed that the funds should be used for the thoughtful best purposes to provide park activities to youth and seniors alike. Some in attendance stressed that particular activities could bring income into the city from outside. Building community pride was expressed. A task force of citizens was suggested to move from a ‘could we?’ discussion to a ‘this is how we can’ mindset. The committee members are already looking for a suitable location for a community garden, which GGG hopes to be part of. The need for a location for teen dances was discussed. The possibility of the city helping community organizations like the Golden Age Center was presented. Our new form of government is doing itself proud. I’ve got a good feeling! Both the Galion Inquirer and Galion Live were represented so I expect that each will cover the meeting and the details. It has been brought to my attention that the Galion Garden Group BlogSpot is so packed with different ways to start aquaponic gardening that a beginner is overwhelmed. I admit that I have a tendency to promote something I find worthwhile with facts, evidence, particulars, specifics and more facts. There is no one prefect way for an individual to start aquaponic gardening. Each of us will have one or two systems that seems viable and appropriate for us given the current time and place. If you have an aquarium or a tote for fish and an empty container stashed somewhere, a grow bed or raft system could be constructed. If you have some PVC pipe, unused rail gutters lying around, or food grade buckets or barrels you may consider one of those methods. 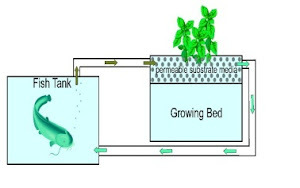 Whatever you do, if aquaponics is new to you start small, set-up an experimental test system, and as you learn you will find the right method for you. If, like me, you aren’t mechanically inclined purchase a small, s-m-a-l-l, SMALL ready-to-go system. Fall is upon us, fewer in-ground crops are available. However, starting an aquaponic garden indoors now will provide you with some fresh, nutritious, healthy food throughout the winter and get you ready to expand your system for the spring and summer season next year.